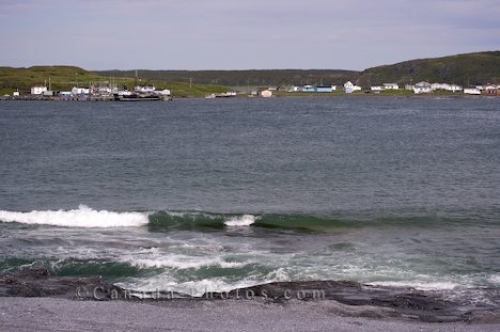 The ocean waves lap up on to the coastal shores at the Burnt Cape Ecological Reserve in Western Newfoundland as the small, peaceful town of Raleigh sits across the harbour. Formerly known as Ha Ha Bay, this town was once a busy place having approximately 400 permanent residents in the midst of the 1980's. A fisheries kept the economy of Raleigh alive until its closure, dropping the population to minimal as people had to move elsewhere to survive. Scientists have since discovered unique species of plants and the tourism level in the town has increased dramatically in recent years. Picture of the town of Raleigh or Ha Ha Bay, Newfoundland Labrador as seen from the shores of the Burnt Cape Ecological Reserve. ... Reserve, along Highway 437, Northern Peninsula, Great Northern Peninsula, Viking Trail, Trails to the Vikings, Newfoundland, Newfoundland Labrador, Canada.